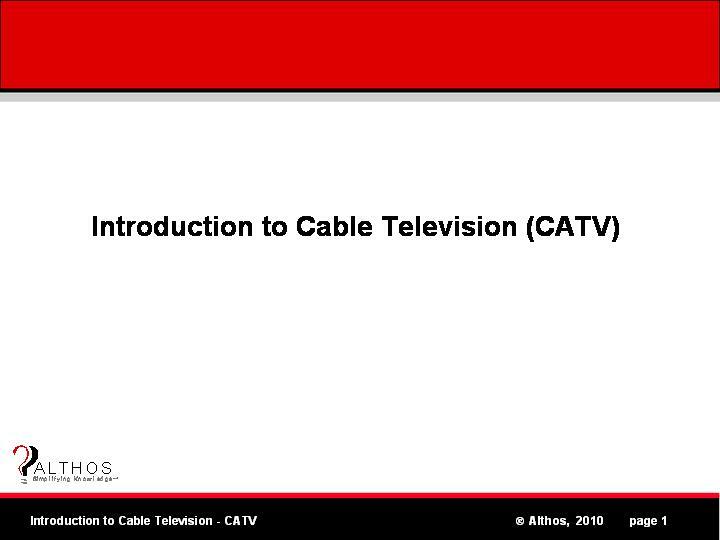 This tutorial explains cable television systems, services, and technologies including digital television, broadband data, and digital telephone service. The types of CATV services are described including subscription TV, pay per view, Internet access, and cable telephony. You will learn about the different types of video including analog video (NTSC and PAL), digital broadcast, and IP video. The different types of video formats are described including standard definition - SD and high definition television - HDTV. The different types of audio are described including multi-channel audio (stereo and surround sound) and digital audio formats - MP3 and AAC. You will learn how cable TV systems can combine and synchronize media (video and audio). The functional parts of a cable TV – CATV system are described including the contribution network, headend, distribution network, and home access devices. Learn how CATV signals can be distributed in the home over traditional lines (such as coax) or using new home media network systems (such as TV over powerline, phone line, and Wi-Fi TV). Learn how set top boxes (STBs) have evolved from simple video switches to high-speed media processing devices that can run amazing programs such as TV widgets and interactive media programs. Cable broadband data systems are explained including data over cable service interface specifications - DOCSIS. You will learn how DOCSIS has evolved to allow cable data transmission rates to exceed 160 Mbps. Learn how cable telephony systems can be modified to provide telephone services. The evolution of cable television is discussed including advances in IPTV, interactive television, and addressable advertising. This book provides an overview of cable television system technology including cable modems, digital television, HDTV, along with how cable systems are converting from analog systems to digital networks so they can offer advanced services such as ultra broadband, video on demand (VOD) and addressable advertising.